Specifying StonePly stone on aluminum honeycomb cladding for more resilient buildings. StonePly is a high performance facade and cladding panel, made up of natural stone facing and aluminum honeycomb backing. The panels resist natural disasters and high impacts, while also providing the ability to flex under heavy loads. The Challenge: In an average year, there are more than 1,200 tornadoes in the USA. These tornadoes blow through with winds as high as 200 miles per hour and result in over 1,500 injuries, 100 fatalities, and billions in property damage each year. The Solution: StonePly has been engineered to tornadic wind speeds and wind loads. The Challenge: In an average year, there are ten tropical storms. Six of which become hurricanes. Along the coasts, hurricanes cause billions of dollars in damage each year. Over 50% of the US population lives in hurricane affected areas. The Solution: StonePly has proven itself hurricane resistant on construction projects all along the Gulf Coast region, from Texas to Florida and into the Caribbean. The Atlantis Project in the Caribbean features over 120,000 square feet of StonePly and has withstood six hurricanes. StonePly has been engineered, tested and approved for high wind areas and has passed large missile impact testing for wind borne debris. The Challenge: Thunderstorms with hail and high winds cause damages totaling in the billions of dollars per year. The Solution: StonePly has been tested and proven hail impact resistant. The Challenge: Flooding makes up over 75% of the federally declared disasters and is the most common disaster event in the United States. Facades must be able to resist both storm surges and potential submergence, often over long periods, at the ground level. The Solution: StonePly can be submerged for extended periods, even years. The panels contain no wood or paper to rot. 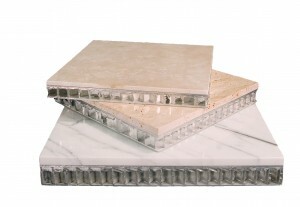 StonePly panels have been submerged for over 10 years without adverse effects. The Challenge: In 2012, some 38 wildfires produced 1.1 billion in economic losses. In cities, building fires are a major concern. The Solution: StonePly is a noncombustible. StonePly is inherently non-combustible both on the face, which is natural stone, but also – and this is important – on the backside of the panel, the side that faces the building. Some competitors use fiber glass or plastic backings for their stones. StonePly never does. Unlike competitor’s panels, the back of our panels is non-combustible aluminum. Both faces offer a 0 flame spread and great fire resistance. The Challenge: Earthquakes pose a serious risk in California, Hawaii and Alaska, but they also affect many eastern and Midwestern regions. Every year there are 5,000 seismic events with 400 earthquakes large enough to cause damage to buildings. Traditional stone cladding is vulnerable to earthquakes. The Solution: StonePly is proven, both in the laboratory and in the field to be able to handle extreme building movement, bending, twisting and racking forces. The aluminum honeycomb reinforcement prevents breakage and falling components. To meet all these challenges, you need an exterior cladding that’s able to resist the forces of nature. Ordinary natural stone cladding is inherently fragile. StonePly on the other hand, can resist impacts from windblown debris, flooding, earthquakes, and fire. Thanks to its unique combination of strength, durability, beauty, and ductility, StonePly is the ideal cladding panel for stone facades wherever disasters may strike. If you need testing data or assistance with detailing StonePly, samples or specifications, give us a call at 903-454-4630.